Back in 1990, Tremors became a cult hit, as it offered a throwback to wacky monster movies from earlier eras. 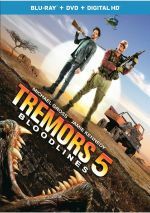 25 years later, the magic of direct-to-video sequels allows the franchise to continue, which leads us to 2015’s Tremors 5: Bloodlines. For the past 25 years, survivalist Burt Gummer (Michael Gross) has worked to battle underground man-eating monsters called “Graboids”. While he hasn’t been able to eradicate this menace, he’s helped keep the Graboids isolated to the Northern Hemisphere. This streak ends when Graboids show up in South Africa. Along with his new assistant Travis Welker (Jamie Kennedy), Burt heads to South Africa to do battle anew with his old foe. Like most people, I didn’t see the original Tremors theatrically. It offered a fairly early example of a movie that didn’t make much of a dent at the box office but that went on to success on video, so I first encountered it on good old VHS. As I recall, I enjoyed Tremors a lot, but I don’t think I’d seen it since the 90s, and I never viewed any of its sequels prior to this one. Does Bloodlines make me regret my lack of interaction with the franchise for the last couple of decades? Not really – while it offers a passable diversion, Bloodlines doesn’t create anything special. I have to admit I’m tempted to end my review right there, as I don’t have a lot to say about Bloodlines. In this gig, mediocre movies become a big challenge. It’s easy to churn out text about something amazing or awful, but when a film falls into that category of “passable diversion”, I find it tough to think of much to relate. On the positive side, Bloodlines generates surprisingly good production values given its presumably modest budget. Most direct-to-video films look cheap and tacky, but that fate doesn’t befall Bloodlines. While I won’t claim it boasts theatrical-level effects and sets, it holds up a lot better than I’d expect. Some of the action scenes also manage reasonable excitement. Whereas the original Tremors went for a 1950s B-movie vibe, Bloodlines comes across more like something in the Jurassic Park vein. It uses monster attacks that follow that classic’s template, and these turn into moderately dynamic sequences. Otherwise, Bloodlines comes across as resolutely average. Gross and Kennedy offer adequate performances, but neither seems especially invested in their roles, and the supporting actors feel like little more than generic “Graboid fodder”. The new characters exist solely to give the monsters humans to attack – they exhibit few discernible personality traits and remain totally forgettable. As a direct-to-video effort, Bloodlines seems above average, but that doesn’t make it something I’d really endorse. 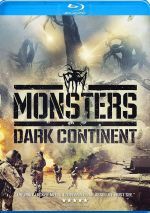 It’s good compared to its peers but never manages to become an especially involving monster story. Footnote: a minor tag shows up early in the end credits. Tremors 5: Bloodlines appears in an aspect ratio of approximately 1.78:1 on this Blu-ray Disc. This was a positive presentation. Overall sharpness remained good. A smattering of wider elements could seem a little soft, but those didn’t create real distractions. Instead, the movie tended to be accurate and concise. I noticed no shimmering or jaggies, and the film lacked edge haloes or source flaws. Given the setting, the palette opted for a fairly yellow/sandy look. Within stylistic choices, the hues looked fine. Blacks were deep and dense, while low-light shots depicted appropriate clarity. The image seemed to be more than satisfactory. I also felt pleased with the film’s DTS-HD MA 5.1 soundtrack. With plenty of monster/action scenes, the mix often opened up to give us active information. These used the five speakers to create an involving, effective sense of these situations and circumstances. The elements meshed together well and moved in a satisfying manner. Audio quality also pleased. Music was peppy and full, while dialogue sounded accurate and concise. Effects demonstrated good clarity and range, with fine low-end response as necessary. This wasn’t quite a theatrical-level track, but it fared well. A few extras flesh out the disc. Tremors 5: Behind the Bloodlines runs eight minutes, 10 seconds and includes comments from director Don Michael Paul, producer Ogden Gavanski, and actors Michael Gross, Jamie Kennedy, Rea Rangaka, Daniel Janks, Pearl Thusi and Sello Sebotsane. The featurette looks at the franchise and changes for this sequel, story/characters, characters and creatures, effects, cast and performances, locations, animals, and related elements. This offers a promo piece without a ton of concrete information involved. Eight Deleted and Extended Scenes last a total of 10 minutes, 21 seconds. In these, we see some extra character exposition along with some action scenes. The latter prove most effective and add some good thrills. A collection of Outtakes goes for six minutes, 58 seconds. It shows some of the usual goofs but adds amusing improv from Kennedy. The disc opens with ads for RL Stine’s Monsterville: Cabinet of Souls, RL Stine’s Haunting Hour and the Back to the Future trilogy. No trailer for Bloodlines appears here. A second disc presents a DVD copy of Bloodlines. It includes the same extras as the Blu-ray. 25 years after the series’ debut, Tremors 5:: Bloodlines offers competent entertainment. Nothing about the film impresses, but it manages to keep us moderately involved across its 99 minutes. The Blu-ray boasts excellent picture and audio but lacks substantial supplements. Tremors buffs may enjoy this flick but I can’t imagine it’ll win over new fans.